What is normally a fantasy world quickly turns into reality when you step foot into Kyaninga Lodge. Perched on a volcanically formed hill, Kyaninga Lodge overlooks an especially beautiful crater lake in Western Uganda near Fort Portal. 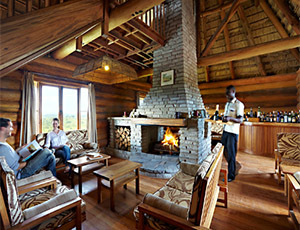 The lodge is conveniently located only 3.5 hours from Kampala, making it the perfect getaway for a weekend of luxury! Arriving late on a Friday night, my colleague and I were warmly greeted by the Kyaninga staff with hot towels and passion fruit juice. 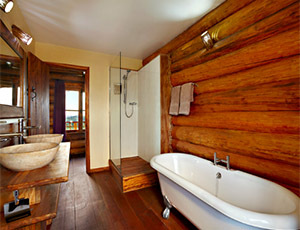 Upon entrance into the lodge, our focus was on the splendid wood architecture. Cozy and intimate, the lodge has a lovely dining area and an adjacent bar/lounge space with a fireplace – perfect for an evening whiskey or glass of wine with a loved one. Guided to our luxurious cabin characterised by its grass-thatched roof, we soon settled in for a comfortable night’s sleep. We found the interior of the cabin to be clean and well designed. The next morning we arose to immaculate beauty, as we looked out from our balcony at the stunning crater lake. It was tempting to stay on that balcony for the whole day, but breakfast and the day’s activities were calling. After enjoying a full English breakfast, we set off for a guided “crater walk,” which led us along the entire upper perimeter of the lake. This 90-minute walk is fantastic and only mildly strenuous. We finished by going for a dip into the remarkably clean (Bilharzia free!) lake. With a recorded depth of over 200m, I certainly did not try to touch the bottom! Another noteworthy activity is a guided “forest walk” through the vegetation that surrounds the lower level of the crater. By the time we arrived back at the lodge, we were tired and ready to feast. Fortunately, the staff read our minds and had prepared a mouth-watering lunch that included fresh bread rolls, beef medallions, and mango-pineapple ice cream topped with a chocolate almond crunch. Feeling stuffed and in need of some “chill time,” we made our way down to the picturesque swimming pool for a swim. The afternoon went by faster than I would have liked. It was already dinnertime. We were served slow roast tomato soup, mustard crusted tilapia, parsley potatoes, and sticky date cake. It hit the spot. Arguably more remarkable than the lodge itself is the story of how it came to be. Steve Williams, the lodge’s owner, came to Fort Portal as an intrepid, 25-year-old backpacker with a plan to spend six months visiting all of Uganda’s national parks. Fate, however, changed those plans when Williams met the late John Simpson, an old-timer Brit who’d been in Uganda for 55 years. Simpson showed Williams the untouched and scarcely known Kyaninga Lake. Williams’ began to dream about the possibilities of what could be built on the land. 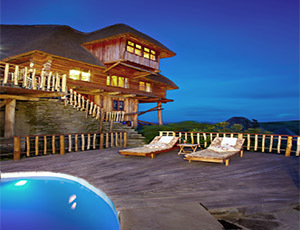 He envisioned building an eco-friendly, all-wood lodge that used only building materials indigenous to Uganda. However, his vision outpaced his skill set! Undeterred, Williams bought the land in 2004 and began to study. He bought textbooks on subjects such as log construction, plumbing, and electrical wiring. Then, he began to teach local workers the basics of construction and prepare them to be the hands that would build his dream. Six years later and after thousands of hours of perseverance, Williams welcomed his first guests to Kyaninga Lodge. Today, Kyaninga Lodge is widely known as one of the most beautiful and exquisite lodges in Uganda. The lodge’s personal touch is noticeable from the time that you enter. This is what makes the experience of staying at Kyaninga so special. I believe that it is a rarity in this world to find such an intersection of astounding natural beauty with remarkable human vision and perseverance. The result is a place such as Kyaninga Lodge. 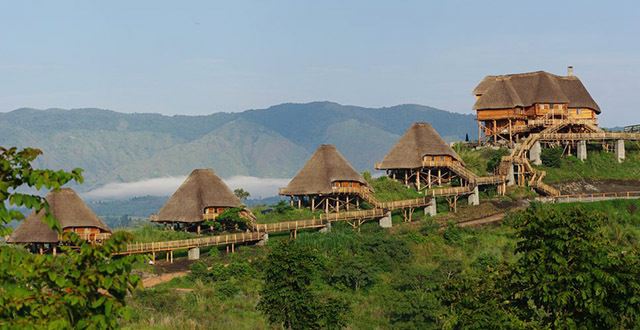 Whether you are living in Uganda or planning a visit, I encourage you to take a weekend excursion Kyaninga Lodge!